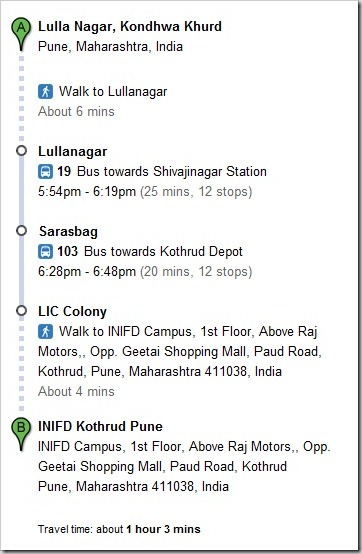 Pune gets Bus routes on Google Maps and it rocks! Let me be honest with you – Pune has one of the worst Public Bus transport service compared to many other cities in India. Not only is it very chaotic, connections between the buses are literally non-existent and timings are non-existent too – or atleast that’s what I have experienced till now. In my more than 20 years living in Pune, the situation has been same – it has NOT improved ! I think with Google Transit coming to Pune, it may make first time travelers that much easier to travel intra-city (although, I have my own reservations). Just to see how well Google Transit performs, I did try and find some really tough routes – and to my surprise, it threw some really good results. Here is an example – Going from Lulla Nagar to Paud Road, Kothrud. Now, even though I live in Lulla Nagar, as far as I knew, there is no direct Bus, or a good connecting Bus route, but to my surprise, Google transit was able to give me a pretty decent results for that request! Not only did it do a decent job of showing me proper route on the map, detailed directions given were quite good as well! Google transit is sure to help a lot of first time travelers to Pune. I just hope that PMPML adheres to bus timings (which I doubt) otherwise, however good the results might be, they are of little use. Top 8 Stock Picks for 2011! although google has these features from long time but still there are few people who do not know about this..So for me it is really very helpful. There is a direct bus from Kondhwa-To-Kothrud Depot every 20-30 minutes. Lulla Nagar and Paud Road are the on way stops for the bus. This route is the best for your travel from Lulla Nagar-paud road. This route is there for more than 20 years unchanged. What have you been doing here since 20 years..
come to bangalore and see the transport system worse then pune.have travelled in pune exensively during my 25 years of stay there. Notice : Two small icons at the top in first screen shot. The second option is available for ONLY those cities who have submitted schedule data to Google in specific format and promise the supply updated schedule data. Recently PMPML did so. Therefore this is a NEWS and a good one. So far in India only Bangalore and Pune has done this. Even Mumbai does not have this feature in maps.google.com. I didn’t get the point of this post ? Google Transit has been available for many cities for a long time ?